The underlying theme of Rituparno Ghosh’s film Raincoat is unconditional unrequited love, immersed in a subliminal mood of surrender and sacrifice in Bhakti Yoga. Rituparno Ghosh is one of the most interesting film directors around and because of the implied nuances of Bhakti, Raincoat has become one of my all time favorite films. It cuts deep into the heart of pain and hopelessness to reveal the interior nature of perhaps a beginning of real freedom. What follows are a series of comments I made on Raincoat as I watched it over time, again and again. On the surface most of the film takes place in one room with two people who have not seen each other for years - but still waters run deep and I found the more I saw the film, the more I understood. Rituparno Ghosh is his own man and in some ways this film stands on its own, resisting any comparison to other films. If you have ever read O'Henry's short stories, which Raincoat is based on, you will have the context of sentiment, the strange mood of the tale. Life is what happens - not what we want, not what we dream of, work for, and not even what we plan. There are no promises, no particular fairness. Life is just what happens and we must make whatever we can out of that. There is a kind of irony nestled within Fate that always leaves us completely baffled. There is humor in hopelessness and often surprise in our loneliness. The film is artfully shot in uniquely subtle colors, shadows and light, mirrors all reflecting the utter despair of the two characters played by Ajay Devgan & Aishwarya Rai. Even though they did not marry each other, they share the memory of their youth’s innocent love back in their village. Neither has anything left to hope for and they attempt unsuccessfully to hide their anguish and personal pain from one another. All they have is the thin sham of pathetic pretense that life has turned out well for them. Ajay is truly brilliant! The scene in front of the bathroom mirror will tear out your heart - my God how did he learn to make such an expression of pain? Mr. Devgan’s acting is getting better and better. I hope he continues to intelligently explore the depths of his emotions as he is doing here. I completely understand why this film was loved in Paris. Raincoat has definite shades of Trauffaut or Goddard complete with the charade of meaningless conversations and the kind of petty bullying that people who know each other all too well inflict on one another. I was lost in that room with them through the entire film. Somnolent and subdued, moving across thin ice, Aish is superb. Raincoat is perhaps some of the best acting she has done thus far. She wears very little make-up and the sad shadows around her lotus eyes belie her pretense to happiness. She rushes to assure her old love Ajay that her husband does not beat her – but, as she so wants Ajay/Manu to believe, loves her very much. Even the best of dreams can go bad. The evenness of her depression and the futility of her life unceremoniously bleed into her silly chatter of money, expensive antique furniture, and the traveling successful provider - all lies. The stark evidence of empty bottles, filth, and enormous cockroaches is hidden behind the facade of a closed door with opaque milky glass. Neither of these two can hide the terrible ravages of truth. Life has been cruel to both of these hapless creatures. All that remains is their tender tragic mutual need to pretend and to secretly sacrifice whatever little they have for one another. This is a great film and certainly not the usual BollyWorld masala. Raincoat is great in its honesty, its simplicity, its essence. We all dream and then, as they say, Life happens. I was so moved by this film - it just drew me in and stayed with me. Raincoat happens underneath your skin, deeper, profound, and probably for those who have had some experience with ‘the slings and arrows of outrageous fortune’! This film is a landmark in cinema, and perhaps that explains why many people who just want to be entertained, as I often do, have trouble grokking Raincoat. It has more kinship with a play and the old Greek or Sanskrit drama, where the audience gets involved and actually learns something about life, real life that is, not prepackaged and sanitized entertainment for consumers – but actual life and its metaphysical implications. We all try to hide our failings, especially from those we love. The sacrificial gift that these two hopeless people offer each other, through the symbolism of the actual 'raincoat' lays bare the grand opportunity life now and then offers. What do we do when we are hopelessly up against the wall? How do we behave? Are we generous, humble, and loving in the midst of our heartbreak - or do we in our weakness give in and succumb to anger, greed, and tyranny. It often seems to me that this Life we live is a game only a God living in eternal bliss would want to play - but nevertheless it is the predicament we all find ourselves in. I can’t say enough good things about the acting in Raincoat. I read that Ajay Devgan said he would do films like this over and over, even if they failed at the box office. This film is classic and brilliant in so many ways. And after seeing it again and again I like the friend's wife character Sheela, played by Mouli Ganguly, more and more. She is the perfect mirror. Perhaps the finest and the most heart wrenching scene is Ajay/Manu tenderly trying to assure Aish/Neeru that she should not give up all hope and that someone will surely rescue her. With all his passionate feelings for her reined in, still pent up inside him, his terrible anguished love revealed only in his eyes, he tells her not to be afraid. If she should ever have the courage to fly to London and her absurdly ridiculous and obsessive fear of being locked in those horrible little bathroom cubicles should happen, then surely someone will come a rescue her. She is crying pitifully, while he seems still too afraid to almost touch her. The interaction between these two in this moment is so tender, endearing, and tragic. Here Ajay, who in the 1990s was India’s Mr. Action-Hero, is at his most vulnerable and this makes him all the more loveable, admirable and attractive. Aish's character is terrified of believing that anything good could ever happen to her again. I loved Aish's acting in this film. And I will say again and again that Ajay Devgan is shaping up to be the finest actor in Indian cinema. Ajay is already a big star in India’s Bollywood. He is not the teen pin-up heartthrob type. But this interesting man has an emotional depth and passionate intelligence that keeps growing and showing up in his performances. I expect to see him around for a long time - and if he is offered better opportunities to act in varied and deeper roles, we will all be the happy enjoyers his superb talents. He would be a wonderful Hamlet. In fact he will be taking on the role of Othello in 2006! I realize that many of you may initially find the emotional tone of this film overwhelming. But I invite you to see it as a work of Art. There are so many excellent artistic qualities to this film that make Raincoat worth watching more than once. For one thing, the skillful composition of the frames shows a high degree 'painterly' intelligence that greatly adds to the mood of the story. The scenes from Ajay and Aish's younger days are bathed in a colorful golden glow suggesting that sweet hope and exuberance of youth in its innocence, yet unaware of how grim the future might be. These golden days contrast brilliantly to the cold harsh light of the interior of Aish's house, the rooms that have become her godown ‘prison’. The light within that haunting heartless room changes with candles and rain and thunder as only a painter might see the mysterious effects of light. The director, Rituparno Ghosh, knows well how to use reflections in mirrors to draw you into other worlds. The whole film has a kind of dreamy and unreal quality to it, which illustrates both Aish and Ajay's characters unrealistic nature. Neither of these two seems at all suited to deal with the realities of the cold cruel world. Life has seemingly treated both of them badly. Or is it simply their inevitable destiny playing out? Even though I do not understand Hindi, I have at times turned off the subtitles to observe the film’s extremely subtle emotional interplay between Ajay and Aish. I feel that there is an underlying similarity between these two human beings - not just as the characters they are playing, but also as their ‘real life’ selves. I feel these two actors share an emotional current - a sort of vulnerable insecurity that fame and money has not altered for them and they both remain wary of the world. Ajay and Aish share an emotional landscape - of course, these are just my intuitive feelings. But nevertheless the chemistry here is powerful and certainly a bonus for the director. This chemistry between Aish and Ajay is not overtly sexual. Rather I would say this is a chemistry of feelings where two people just stand on a kind of emotional common ground and this sharing makes their performances here all the more interesting. I do not understand how anyone can dare to say that Aish can't act after seeing this film. Here she is subtle, sad, forlorn, petty, lonely, desperate, and hopelessly brave in the face of utter destitution. She delivers her lines with the innocence of a worn out and down woman - not the proud or arrogant Miss World as people wrongly sometimes perceive. Besides being now considered perhaps the most beautiful woman on the planet, Miss Rai is an intelligent talented actress – and a great dancer! The ease with which her character Neeru lies to Ajay about her life makes one realize that long ago she began to lie to herself. She treats him as if he remains the taken-for-granted but loved man in her life and he timidly cherishes every minute of it. Ajay's contained adoration for his childhood sweetheart is something to behold. Mr. Devgan does that compression-of-passion thing so well! One feels that his character has never been able to let go and express himself – except once, the day before her marriage, when it was too late. Even now in that soulless eerie room he smokes one cigarette after another and holds everything in, while he glances longingly at her, hoping she will not notice. Like a thirsty man drinking water at last, Ajay/Manu listens intently to her singing softly in another room as she prepares tea. He does not want to her to leave him to go to the corner store for his lunch. He cannot bear to be parted from her again even for a minute. “I’m not a fool anymore...” he sweetly tells her. Ajay's performance in Raincoat is one of his best and is deeply moving. The heart breaking moment in front of the mirror, with his face absurdly covered in shaving cream, is only the beginning. 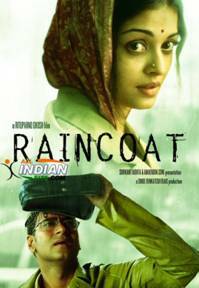 If one sees Raincoat as a work of Art, you experience Indian cinema at its very best, along with some incredibly beautiful music. Raincoat is a work of ART! The more I watch this film, the more I love it. I am constantly amazed at the subtle interactions that go on between Ajay and Aish, as if they are living on the same emotional plane. The way he maneuvers her into being jealous of his imaginary life is fascinating. With just a slight gesture, a subtle turn of his head or a half smile, Ajay manages to convey his intensely suppressed love for this girl whose life has become mired in a web of deceit so deep one wonders if she even knows the difference anymore. And Aish is magical spinning her lies of pretense in the face of utter hopelessness, while chewing her necklace (fastened with a safety pin) and haughtily calling Ajay/Manu a country mouse! Yes, the more I watch this film, the more I love it and I am beginning to feel that Raincoat is flawless. Great art thrives on repeated viewing and every time we look at a really superb work of art, something new is added to our understanding - not just of the work itself, but also of life and therefore ourselves. I can never get tired of looking at Cezanne for his cosmogonic insight into Nature’s geometry, or Tiepolo's oil sketches that are so full of life the brush strokes seem to be writhing snakes of Kundalini. I never weary of Vermeer's light or the deep shadows inviting me into the landscapes of Claude Lorraine. Van Gogh's pencil drawings of the French countryside make me feel as if he has somehow captured on paper the life force itself. There are a few films that I have watched all through the years and every time I see them I become aware of something new. Michelangelo Antonioni's Red Desert is one of these. I sat through this film twice the first time I saw it back in 1964. This is the ultimate painter's movie, with every frame intelligently composed to reveal Antonioni's cut-to-the-bone raw meaning. The beauty of exquisite perfect film frames magnifies the harshly brutal theme of The Red Desert - the destruction of the feminine principle of Nature by the ever encroaching, deafening, dehumanizing, and toxic monster of industry that poisons the land, water and life. Raincoat is similar to the Red Desert in the way Rituparno Ghosh has carefully intelligently crafted every frame to express the emotions between these two people. They both suffer from the weakness of a kind of unconscious paralysis. Neeru's silly petty selfish greed is somehow the perfect balance to Manu's inability to effectively express his feelings. They are both prisoners of their own flawed character. While Dil Se is still one of my very favorite films ever because it is a metaphor for spiritual union, I must say that in comparison to Raincoat, Dil Se has cinematic flaws. And I am beginning to feel that Raincoat is indeed a flawless film. The underlying creative excellence and artistic thought that went into Raincoat are what make it classic film material and it is quickly becoming one of my all time top favorite films ever - east or west! Dear one, why are you so angry? Cracks have eaten the walls away. On which a lifetime's tears race. From Mathura a palanquin on four shoulders. Where is my golden love this hour? The courtyard is so lonely. Over the glass in tearful pain. To fill the vacuum with their call. Still my desire to bathe isn't fulfilled. Everything it seems will end the same. Tilting the picture on the wall? The music in Raincoat is powerful and devotional. I love Hariharan’s voice and the soulful resonance he creates in the song PIYA TORA KAISA ABHIMAN is superb. The theme song MATHURA NAGARPATI sung by Shubha Mudgal is one of my favorite songs ever. I often listen to this song at night before I meditate. The lyrics relate to Bhakti Yoga and Krishna’s return to visit his beloved Radha. He leaves his palace and his wives, and heads for Gokul. Krishna will be reunited with his Radha. Why can’t you forget her? Oh lord of Mathura why are you going to Gokul. The underlying theme of Raincoat is unrequited, unconditional love immersed in a kind of subliminal Bhakti mood. Ajay’s character Manu is there in the face of all rejection, disregarding the advice and warnings from his mother & his friend. He has lied and promised not to stay long, but it is evident that he wants nothing more than to bask like a child in her presence, to listen to her sing, and gaze longingly at her through the milky glass. "Unrequited love is the most precious love of all." As we age we pretend to be cynical as a pathetic defense - pathetic in the sense that no one really has any effective defense against the eternal ‘slings and arrows of outrageous fortune’. Sooner or later every human being finds himself or herself in a situation where they are blocked in at every side - that moment when suddenly, in spite of all our brave plans and sweet dreams, we are helpless and hopeless. We are not king of the world at all. This very human experience of the complete loss of hope is in all great drama. Hamlet is paralyzed by his own doubt - he cannot dismiss what his father's ghost has told him and yet he cannot believe in it enough to take action. Trapped in his own confusion, the young prince cannot act and seeks hope in death, even his own ... ‘to sleep, perchance to dream ... ah, there's the rub’. What if death is only another form hopelessness? What if the oblivion promised in death is not found there? The classic Indian character Devdas also suffers from a lack of hope. His weakness and indecision have destroyed his hopes of ever spending life with his beloved Paro. Fearful of his father's wrath, he has let the moment of chance pass by and now she is gone, lost to him. Devdas finds release in the selfish hope of oblivion and death, the false and inevitably brutal hope of the drunkard. In the Bhagavad Gita, Arjuna too is suffering from a sense of hopelessness when in the middle of the battlefield he sits down in his chariot. He simply cannot see the benefit of killing the once beloved members his family in the Great War of the Mahabharata. Blocked in on all sides by his memories of loving teachers and friends, his will to act is paralyzed. He tells Krishna: "I will not fight!" Of course unlike Hamlet and Devdas, Arjuna has Krishna to wise him up! In Raincoat, both Ajay and Aish have lost all hope and each is desperately grasping at a way out. But these two people are not grand elevated souls, like Arjuna or even Hamlet. They are more modern, more ordinary, more like you and I. In fact they are both weak. Aish's character cares more about the color of her new car than her childhood sweetheart. And what is it in Ajay's character that always prevents him from ever just really telling his love what he feels? Why does he not grab her in her dressing room that day? Why does he not embrace her when she cries and says ... "Please do not offer me any hope..." There is something timid and weak about him, and like Hamlet and Devdas, he lets these crucial moments pass - he cannot act. All that remains for these two in their hopelessness are their miserable little lies and kind small acts of generosity. These two find hope in love’s memory. As human beings, young or old, we cannot live without hope. Only the old often know this a little better than the young. Faced with intractable pain and a life without hope, some may see the very beginnings of real freedom. Need I say, I highly recommend the film Raincoat?